In September 2013, UCSD professor Ghassan Zakaria came under fire from the anti-Palestinian group “Stand With Us” for his use of a map that indicated historic Palestine but did not label any part of the territory Israel. Below is a press release issued by SDSU SJP in response to those events, as well as the following other resources. Although the issue is in many ways minor, it is important to document the ongoing attempts to attack Palestine in classrooms across the state, and the ongoing efforts by anti-Palestinian groups to bully university administrators. San Diego, CA, September 11 – This week, San Diego State Arabic lecturer Ghassan Zakaria came under pressure after he handed out a map to his students which labelled the territory of Palestine as Palestine and not as Israel. This was brought to the attention of “Stand with Us” by a student in Zakaria’s class. Stand with Us is a Zionist organization, infamous for supporting Israel’s occupation of Palestine as well as Israel’s apartheid system which violates the human rights of the Palestinian people. 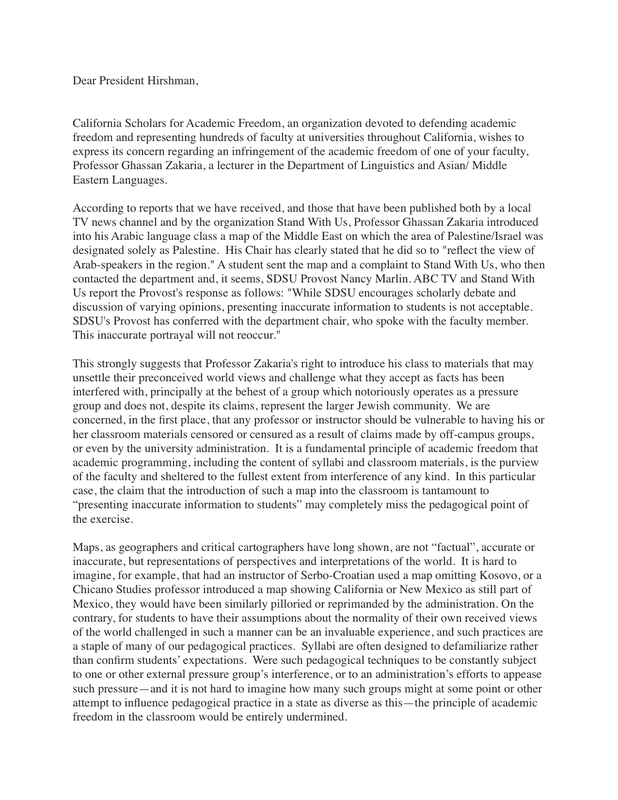 According to 10 News San Diego, Stand with Us then notified its members and encouraged them to write to the Arabic and Islamic Studies’ department chairman and program director, who replied that the map reflects the perspective of the people from the Middle East and North Africa. As a human rights organization and as a diverse group that represents a large number of SDSU students, Students for Justice in Palestine is displeased with the university’s reaction and with the pressure faced by professor Zakaria. The map not only reflects the opinions of the vast majority of those who inhabit the region which the students are attempting to study, but it is also historically accurate and a valid opinion that must be defended like any other under the principle of academic freedom. 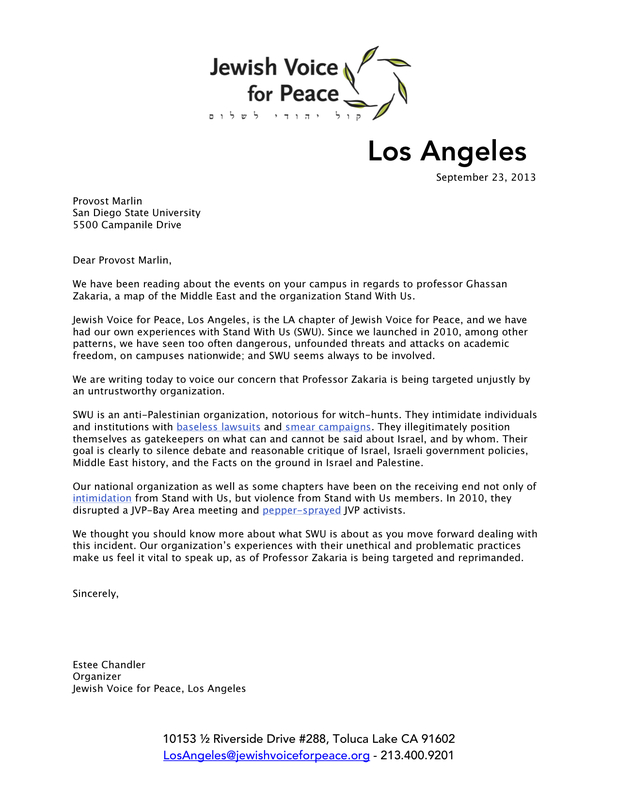 Students for Justice in Palestine has issued a letter to the university provost in defense of professor Zakaria’s academic freedom. The letter has been signed by the Afrikan Student Union, Amnesty International, the Muslim Student Association, the Arab Student Association, Mecha, Acha, Al-Awda and of course Students for Justice in Palestine. SJP describes itself as an organization of diverse students, faculty, staff and community members, organized on democratic principles to promote justice, human rights, liberation and self-determination for the Palestinian people.